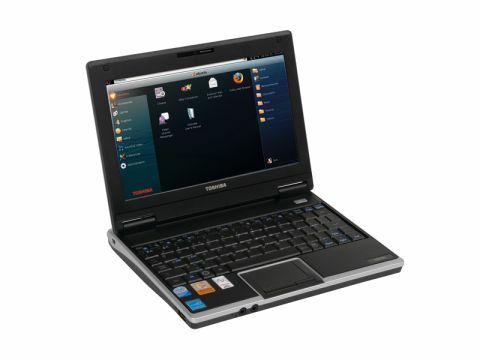 While the super-slim Toshiba R600 is a premium product, Toshiba has released the Portégé A600-122 (£1115 inc. VAT) that offers a similar ultraportable design, but at a more competitive price. The design has a plastic casing that feels reassuringly robust. The padding behind the screen is solid, but still maintains a degree of ﬂexibility to the design.The twin hinges are cut into the main body and make for a slim proﬁle. The big difference between this laptop and the more svelte R600 is the addition of a built-in optical drive. By making this a two-spindle machine, it makes it usable by a wider market segment, but increases the weight to 1.5kg, which is still highly portable. Features include an integrated HSDPA module, which isn't tied to any particular supplier, so you can go with your current service provider for wireless broadband. You'll also ﬁnd a ﬁngerprint scanner sitting between the mouse buttons and even a webcam positioned about the screen. Perhaps the most compelling reason to opt for this machine is its battery life. Under test conditions, we found it offered over seven hours of battery life from a single charge. This is more than enough for most users and means you can work for large portions of the day without needing to carry a power supply. Due to the location of the screen when it's open, you won't ﬁnd any ports on the back of the laptop. Instead, Toshiba has decided to keep them to a minimum and add only the essential ports. Highlighting the business roots of this machine, Toshiba has used the Intel 1.2GHz Core 2 Duo U9300 processor, which is an Intel vPro chip. This means your IT manager can update and maintain your laptop's condition remotely, either over the network or whenever you connect to the internet. Being an Ultra-Low Voltage (ULV) processor, this isn't the fastest of dual-core chips, but it's quick enough to run multiple ofﬁce tasks with ease. We found that Windows Vista Business loaded smoothly and that the Portégé never noticeably slowed during use. The keyboard spans the full width of the chassis, giving the keys plenty of space and making them as close to full-size as possible. We found this an incredibly smooth keyboard to use, as the keys are ﬁrmly ﬁtted and have a solid typing action. The Toshiba Portégé A600 may seem to some a compromised R600, but we feel it has sufficient power and usability to stand on its own merits.